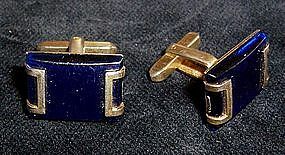 Cobalt-colored lucite and gold-colored metal cuff links. Gray mother of pearl buttons are 5/16" in diameter and are set on gold-colored metal. Back rods are 7/8" long and spring-loaded. Six pieces - Mother of pearl and gold-colored metal buttons are 1/2" in diameter with 1/4" back buttons. Three with shanks of 1/4" and flattened back buttons. One with shank of 7/16" and flattened back button. Two with shanks of 9/16" and round back buttons. Button studs, cuff links and collar button. Glue has yellowed on a few.